One of the new Mac OS X Lion is the creation of the famous rescue partition that can restore a Time Machine backup, surf the web to find information in case of problems, launch Disk Utility or to reinstall Leo. This last feature was criticized by some because it required mandatory internet connection. Until recently, it was not activated. Now it works, we could try it, here's how it operates. Once the Internet connection on, Apple checks the eligibility of your Mac. It is unclear exactly what data passing between servers and Apple Computer. During this operation, a small message appears: "Loading setup information". The procedure takes at most a few seconds. The next screen is more conventional. The application asks you to accept the terms of the license agreement and then specify the disk you want to reinstall your system software. In our case, it was not possible to customize the installation. 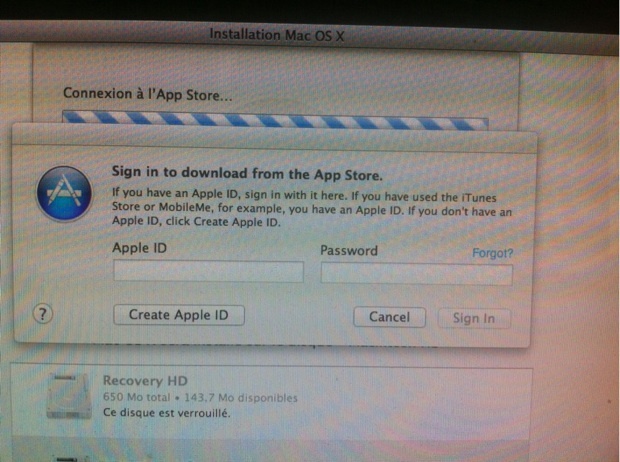 Second, and the big news, you need to enter your Apple ID for the Mac App Store. 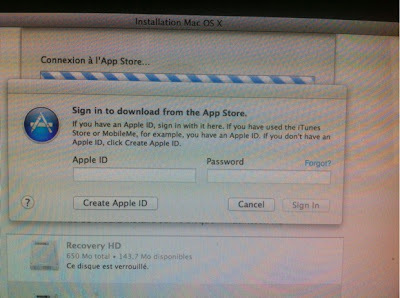 Therefore, Apple validates that you have indeed already purchased Mac OS X Lion. In line with Apple, this is understandable since the installer will then begin downloading the system via the Apple platform. Note that if you reinstall the system retrieved directly from the application via the App Store Mac, you do not identify you or on Apple's servers, or need an Internet connection. The disadvantage of this recovery process, except if you have a good connection, is that you have some time ahead. With an ADSL2 connection, the estimated time to download the system components and install them in our case was almost six hours. Once the download is complete, the computer restarts and the installation are finally beginning. The advantage of this method is that with any luck, it will do the "dirty work" instead of users downloading not only the system but also the different successive updates.